The Netherlands is famously a country of windmills, and while the wind-swept countryside would seem the most appropriate spot for them, even the cities have their mills. Find out all about the urban windmills of Amsterdam, including their history, architecture, and visitor information. Open: Every second Saturday of the month from April to October and on National Mill Day (the second weekend in May). Krijtmolen d'Admiraal is a late example (1792) of a tower mill, once used to mill chalk (for use in paint and putty) and trass (volcanic ash used in mortar). It's said to be the only wind-powered chalk and trass mill in the world still in use. Have a look at its website; if the animated mill is active, then so is its real-life counterpart. The mill is named after its first owner, Elisabeth Admiraal, who is a descendant of a prominent admiral who chose his title as the family surname. She was 90 years old when the mill was constructed but died the year after its completion. After the last miller retired, in 1954, a local preservation society was founded to restore the mill, which is now the last chalk mill left in the country. Dutch windmills aren't restricted to the wide-open spaces of the countryside; visitors can find them even in urban Amsterdam, just paces from the city's most popular spots. Anyone who stops at the Westergasfabriek—be it for brunch at the ​Bakkerswinkel, coffee at the Espressofabriek, or mussels at Mossel & Gin—will find an attractive flour mill just across the street from this hip restaurant and culture complex in the city's northwest. While the exterior can be admired all year round, the interior is only open on ​National Mill Day. De Bloem (pronounced 'bloom') Windmill—sometimes called De Blom—was built in 1768 as a new-and-improved successor to a previous mill. The older mill was a post mill, which means it is a mill whose body mounted on a vertical post must be rotated so that its blades face the wind. The new mill, which is a tower mill, allowed for only the cap or upper part of the mill to be rotated while the base stayed put, a more stable and efficient set-up. The current mill was actually erected in another part of the city but relocated to make room for the present-day Marnixstraat. It takes its name from De Bloem, the former rampart on which the mill once stood. Open: No, but don't miss Brouwerij 't IJ while you're there. De Gooyer is one of the city's favorite windmills—not only because of its beauty, history, and monumental status but also because of the city brewery that sits in its shadow. Situated on a slice of land between the Kadijken, the district just north of the expansive Artis Zoo, and the Eastern Docklands, De Gooyer is a classic tower mill that, at 87 feet, is the tallest wooden mill in the country. In the shadow of this veritable skyscraper of a windmill, visitors will find the Brouwerij 't IJ, a microbrewery with an on-site bar—once the mill's bathhouse—that features a spacious patio. While the mill itself is closed to the public, tours of the brewery are held every Friday, Saturday, and Sunday. Like Molen De Bloem, De Gooyer started out as a different windmill in a different location—another instance of an early 17th-century post mill that was moved several times over then was eventually replaced with the more advanced tower mill that exists today. Soon after, in 1759, it was moved to its current location in the Funen. (The mill is sometimes, but rarely called the Funenmolen.) The mill takes its name from the brothers who owned the old post mill, who hailed from the Gooiland or Het Gooi, the ritzy southeastern corner of North Holland where the media city Hilversum is situated. Sawmills, as one historian writes, came in two varieties: the common tower mill and the paltrok mill, few of which survive in the Netherlands today. De Otter, which dates from 1631, is an example of the latter; while dozens of sawmills once populated the Kostverlorenvaart—a canal that lines the western boundary of the Frederik Hendrikbuurt—the Otter is now the only one left. 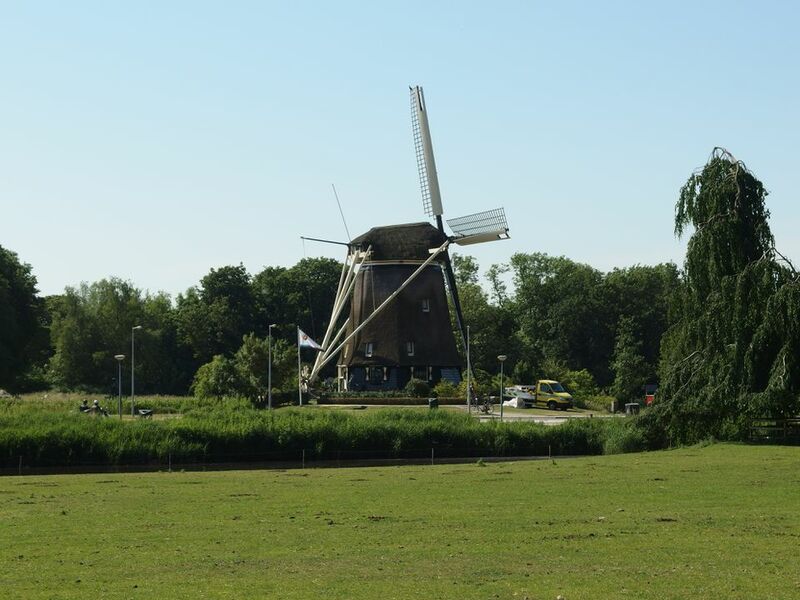 What's more, the city almost lost the windmill when, in 2011, its private owners attempted to have it moved to a windmill park northwest of Amsterdam. De Otter is special to windmill enthusiasts because it's one of just five paltrok mills that still exist in the Netherlands. The paltrok mill, a subtype of the post mill, sits on a base fitted with wooden rollers that rotate the mill to face the wind. The shape of the mill is said to evoke a paltrok, a loose jacket, fashionable in medieval times, that was fastened in the middle with a belt—hence its name, which is usually left untranslated. These mills were once prevalent in the Zaanstreek, a region known for its windmill-driven industry. In fact, a reconstructed paltrok mill—open to the public—can be found at ​Zaanse Schans. De Riekermolen stands at the southern tip of the Amstelpark, where it shares the bank of the Amstel with a monument to the painter Rembrandt van Rijn. The artist sketched the river bank prolifically, but while the windmill was constructed in Rembrandt's time— in 1631—it didn't comprise part of the river bank's scenery until more than 300 years later when the city moved it there from the west. This explains why the Riekermolen is a polder mill without a polder. To reclaim the country from the water, the Dutch used these mills to harness the force of the wind to drain water from the land. The Riekermolen once stood in Sloten, not far from the Molen van Sloten. In the 1950s, the windmill was retired from service and moved to its present, scenic location. Quite possibly the most famous of the city's windmills, the Sloten Windmill owes its popularity in part to the fact that it's open to visitors every day, all year round (closed some holidays). The tower mill wasn't constructed until 1990 and has been in use since then as a polder mill. Because of its new construction, it's one of the few windmills outfitted with an elevator, so disabled visitors can also enjoy the mill's interior. The mill also features two permanent exhibits: one on the life of Rembrandt, whose father was a miller; the other, "Amsterdam and the Water," explores the city's relationship with water, an appropriate theme for a polder mill. Next door, the Kuiperijmuseum (Coopery Museum) is dedicated to the manufacture of wooden barrels—a unique tribute to an esoteric trade. The next two windmills share a similar history, a similar name and—once upon a time—a similar location. Now they are in two different parts of the city. Both are fairly distant from the city center, so it's best to hop on a bike to reach them. Only dedicated windmill aficionados trek out to the far reaches of the city to see this windmill, called simply De 1100 Roe—the 1100 Rods. Like other windmills on this list, the name refers to the mill's former location, 1100 roeden, or "rods"—an old unit of measurement that equals some 16.5 feet—from the Haarlemmerpoort. There it served as a polder mill from 1674 until the mid-20th century, when it was dismantled and rebuilt farther south to keep the terrain of the Sportpark Ookmeer dry. Both the 1100 Roe and the 1200 Roe were used to drain nearby polders. The 1200 Roe, however, still maintains its location exactly 1200 rods (three miles) west of the Haarlemmerpoort—another location that only the most ardent devotees will seek out, at four miles from the city center.